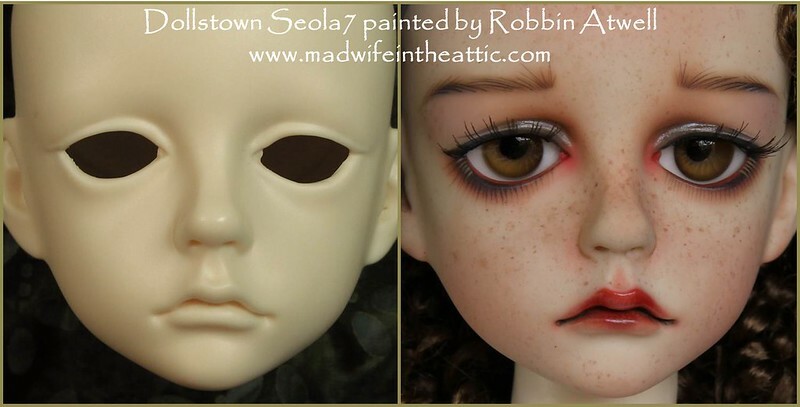 Seola is made by Dollstown of Korea. 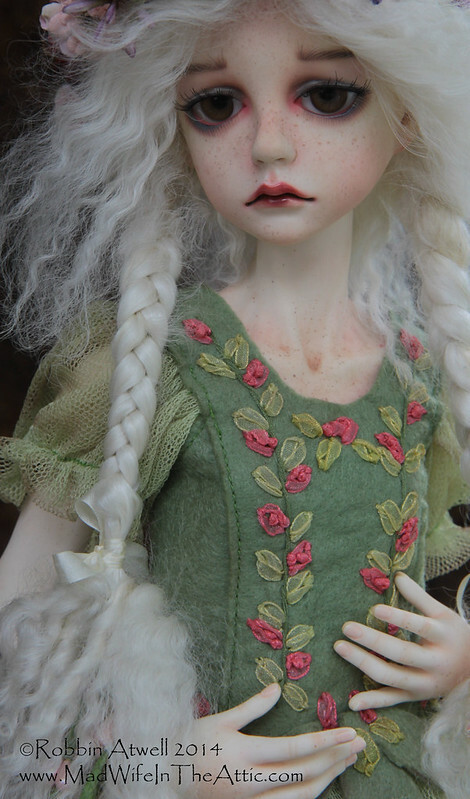 She is “Fresh-Skin” toned resin and she’s on the “Elf” body. 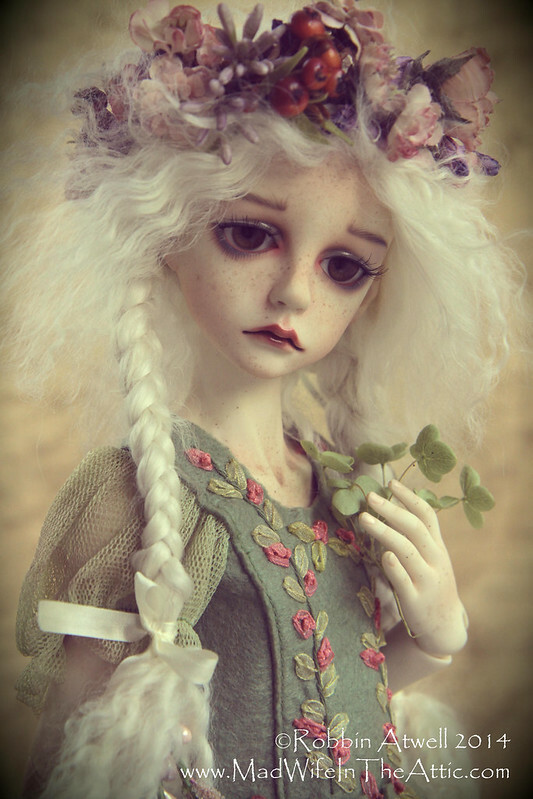 I painted her face, blushed her body, and made a wig for her. 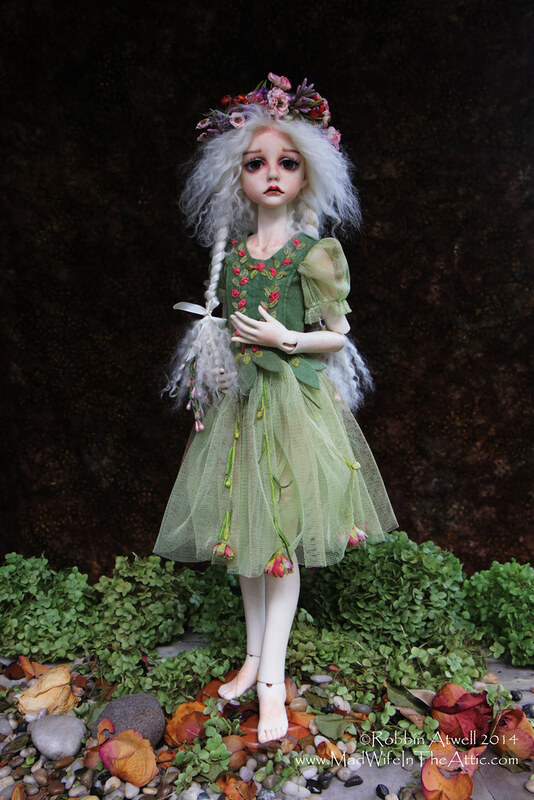 She is wearing a dress made by the Kish company and I customized it for her – I wanted her to wear an outfit that would look good with bare feet because I like her toes. 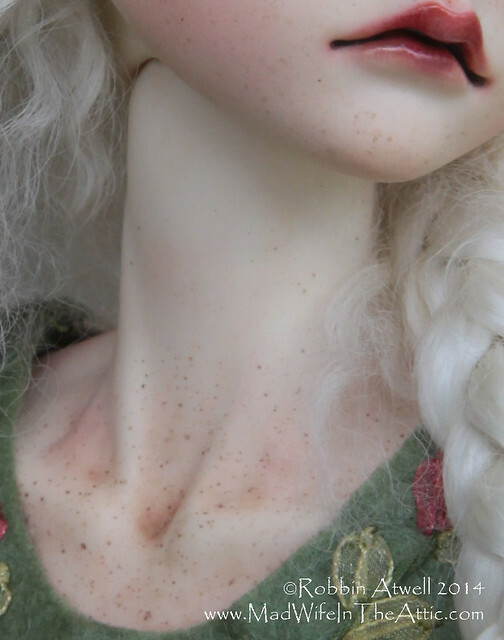 I’m sharing some pictures of her in process and a few customizing tips along with lots of pictures of her once she was completed. There are many more pictures of Seola in her Flickr Album. Sand the seams and give all the body parts a really good cleaning. You may not want to invest the time and extra work to sand, but once you blush, you can’t go back and do it later. Cut up coat hangers and thread the wires through all the body parts then make loops on each side. You can hold the wires when spraying the parts with sealant, then use the wires to hang them. You can leave the wires in place while you are blushing. Try not to put color on parts of the body that will get rubbed. Before spraying, wipe pastel dust off of the joint areas – rosy joints look great at first but they’ll quickly get rubbed and scratched, and your beautiful blushing job will look shabby. I also use multiple colors in the pink to peach to beige range for blushing. If you only use one blushing color, she will still be a little flat. I use watercolor pencils to make natural looking finger and toe nails. As a last step, coat the nails with gloss. I use Golden products. 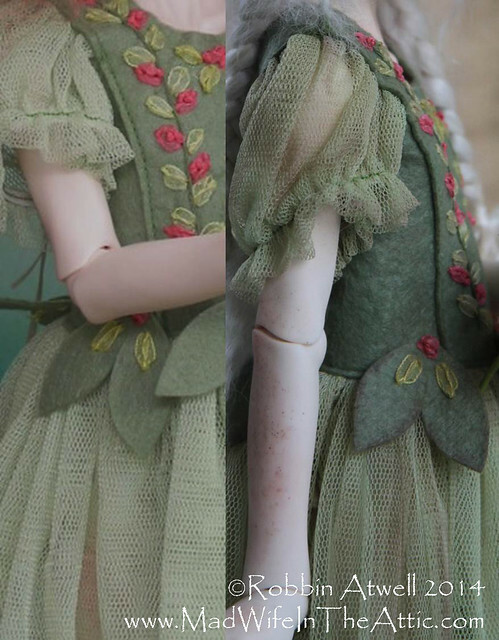 Using tea and coffee to artistically stain fabric and make it look antique is a great technique for doll fashions. Unfortunately, you can only do that with natural fibers like cotton, silk and wool. This dress is made of synthetic felt and polyester netting – basically, it’s plastic so the coffee and tea wash out completely. 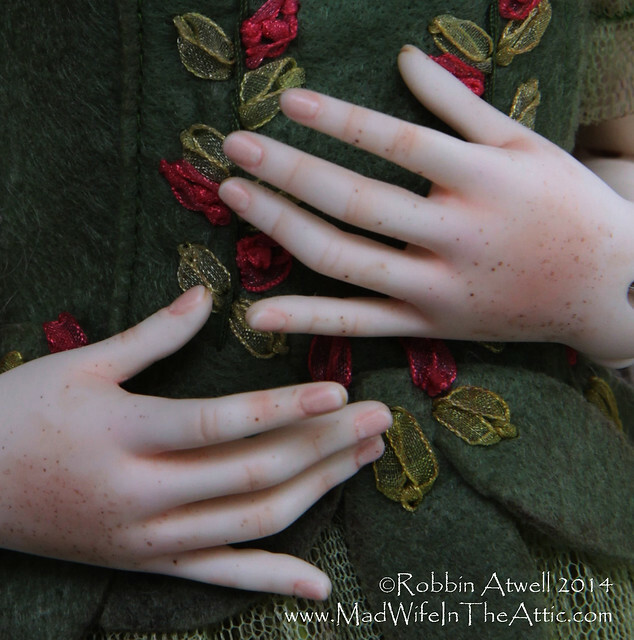 For this dress, I used dark brown acrylic paint. Wash the fabric in detergent to remove any sizing. While it is still wet, lightly brush watery paint onto the areas you want to darken. Let the paint get almost dry then rinse the garment. Let it dry and apply paint again if you still don’t have the look you want. 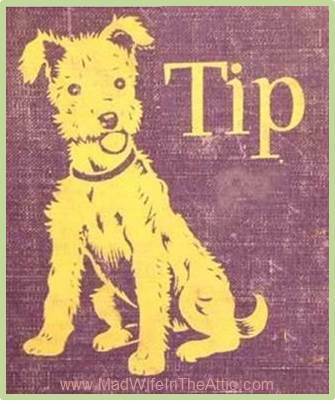 Test this in an inconspicuous area first if you can. Above all, don’t do this to a garment you love just in case you can’t get the result you want. I also threaded the stems of flowers into the netting. This completed the “Nature Girl” look. 31 Jul	This entry was published on July 31, 2014 at 5:52 pm. 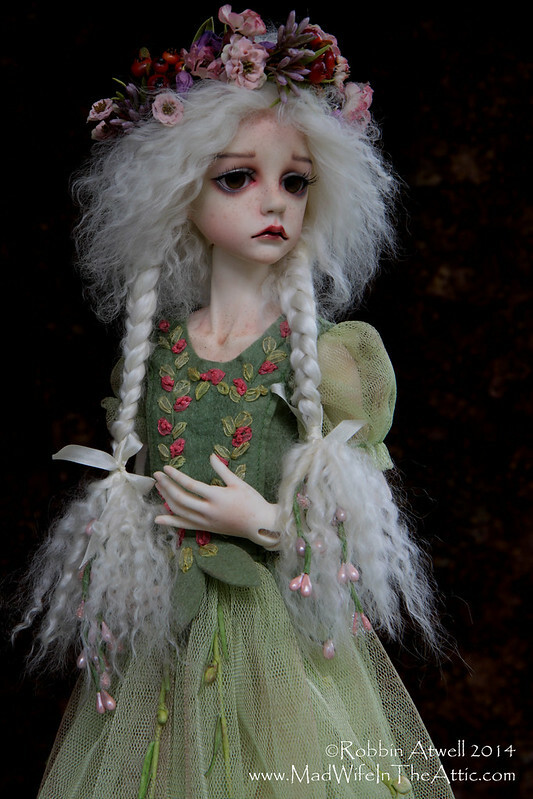 It’s filed under BJD Faceups, Doll Clothes, Doll Wigs, Tips, Tutorial and tagged ABJD, Ball Jointed Doll, BJD, Customize, Dollstown, Elf Body, Fresh Skin, Kish, Robbin Atwell, Seola, tea stain, UFDC. Bookmark the permalink. Follow any comments here with the RSS feed for this post. This is awesome. I love her hands and feet. So realistic looking. Dear Robin. 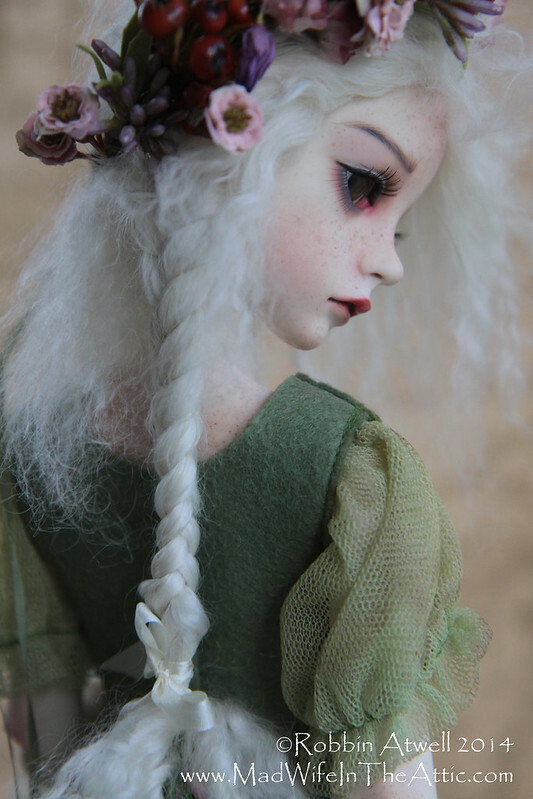 I have been looking at all you stuff on your blog and I love every bit of it. 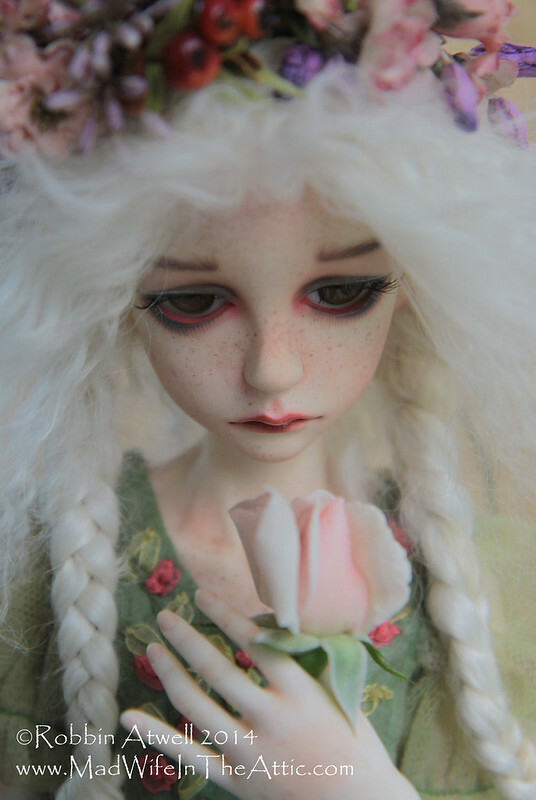 I have recently become addicted to BJD’s and reading your blog has been so interesting, inspiring and informative. Thank you for taking the time to share all this wonderful information with me. You are truly a talented person on so many levels.